According to a recent study, Utah and many other states and metropolitan areas were listed as ‘hotspots’ for vaccine-preventable diseases. The main reason being children contracting diseases after their parents opted out of getting vaccinations. 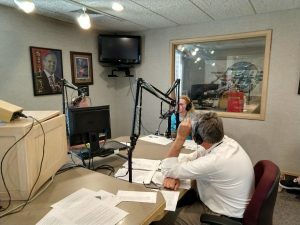 On KVNU’s For the People program on Friday, Dr. Ed Redd, long-time physician with the Bear River Health Department, and nurse Lisa Perkins, who is the immunization program manager, talked about the importance of immunizations and vaccines. Dr. Redd talked about what happens in ‘hotspot’ areas. “What happens in those situations is the community immunity, the amount of immunity against a certain type of disease, drops statistically from say, like 95 percent maybe down to 85 percent or 70 percent depending on how many people decide not to protect themselves with vaccines,” he said. Dr. Redd said to know that vaccinations are effective, all one has to do is look back into the health department’s certificate archives to see what happened to people in the 1800’s and 1900’s before there was access to many of the vaccines we currently have. He said it brings a tear to his eye when he sees the pain inflicted on families and individuals from the deaths caused by whooping cough, diptheria and measles outbreaks, in addition to other maladies common back then. Perkins said today many take vaccinations for granted. “A lot of doctors and people in the community now have never seen the actual diseases because there, thankfully, is a lot of herd immunity from people being vaccinated. That’s why we have such importance and stress on keeping people vaccinated so that we can protect those diseases from returning,” she said. FILE – Influenza season is upon us in Utah, and state health officials are urging residents to get a flu shot to help to protect themselves against a potentially deadly disease. Photo courtesy of the Centers for Disease Control and Prevention. Dr. Redd says with the flu season knocking on the door, the medical community is gearing up and it’s important for people six months and older to receive a flu shot. 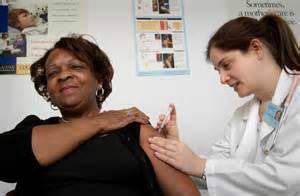 “Getting the flu vaccine is a way to protect your family and others in the community who are more susceptible to it,” Dr. Redd explained, “because there will be less cases as a result. Dr. Redd said parents would be wise to talk to their doctor about this and other illnesses that are common this time of year. A small grammar correction: it’s ‘fewer’, not ‘less’ … which you used incorrectly twice in this article on vaccinations. …just sayin’.